Ames, IA — A gift from Bühler Inc. has established the Bühler Lecturer in Feed Technology position at Iowa State University. 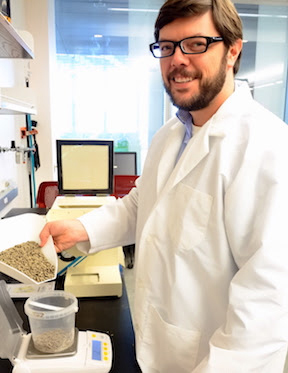 As the Bühler Lecturer, Cook is teaching a new course this fall in feed processing and technology and leads laboratory sections for a grain preservation course. He will be a leader with other faculty in developing a new minor in feed technology that will help educate a new generation of talent for the grain and feed industries. He also will support continuing education for feed industry professionals. Cook also is part of a team developing plans for a new feed mill and grain science center. In September, Iowa State’s College of Agriculture and Life Sciences announced $14 million in gifts in support of the new educational and research facility, a $21.2 million project to be funded entirely through private giving. Those gifts have jump-started in-depth planning and development as fundraising continues to meet the final goal. “Supporting this faculty position is an investment in the future of the U.S. feed industry,” said Rene Steiner, president of Bühler North America. “We look forward to the leadership that the Bühler Lecturer will provide to developing the new feed technology minor. “It’s exciting to see Iowa State offer these new courses that teach the fundamentals and address key knowledge gaps and challenges. They will better prepare students for careers in the feed industry,” said Morantes. Cook earned a bachelor’s degree in feed science and management and a master’s degree in grain science, both from Kansas State University. While at Kansas State, he helped to develop educational and training materials for grain industry professionals, and conducted research in preserving grain and feed ingredient quality by controlling stored grain insects. One of his internships was spent developing a quality assurance program and training employees for a feed mill in Laos. In his previous position at Iowa State, Cook helped to coordinate an international poultry and feed value chain project in Ghana. Cook is a native of Spirit Lake, Iowa, where his family operated an equipment manufacturing and supply company for the grain and feed industry. He worked for the company several years before pursuing his academic career. Bühler is a leading supplier of processing technologies for grains, animal nutrition, cocoa, coffee, snacks, noodles, biscuits, chocolate and other food products. Also, Bühler is a prominent solution provider of die-casting and surface-coating technologies in high-volume application areas, such as automotive, optics and inks. The company invests up to 5 percent of its revenue every year in research and development, a key element of success for its 157 years of existence. In 2016, its roughly 10,500 employees in over 140 countries generated a turnover of $2.5 billion. The globally active Swiss corporation is family owned and particularly committed to sustainability. For more information, visit www.buhlergroup.com. The Iowa State University Foundation is a private, nonprofit organization committed to securing and managing gifts that benefit Iowa State University. For more information, visit www.foundation.iastate.edu.